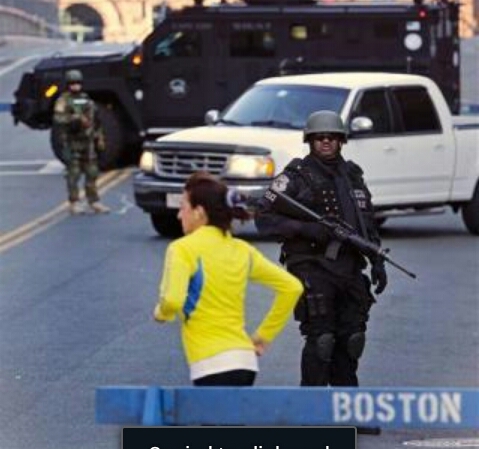 Police and federal agents appealed to the public Tuesday for amateur video and photos that might yield clues to the Boston Marathon bombing as the chief FBI agent in Boston vowed "we will go to the ends of the Earth" to find whoever carried out the deadly attack.Two bombs blew up seconds apart Monday at the finish line of one of the world's most storied races, tearing off limbs and leaving the streets spattered with blood and strewn with broken glass. 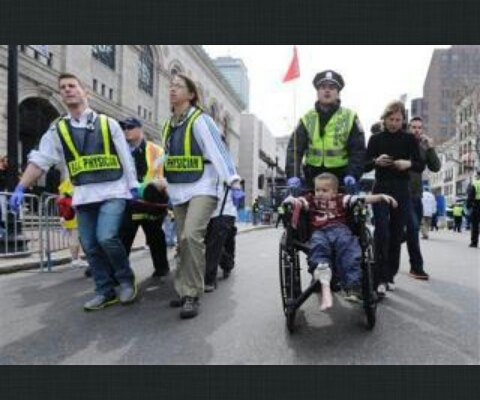 Three people were killed, including an 8-year-old boy, and more than 170 were wounded.A doctor treating the wounded said one of the victims was maimed by what looked like ball bearings or BBs.Federal investigators said no one had claimed responsibility for the bombings on one of the city's biggest civic holidays, Patriots Day. But the blasts raised the specter of another terrorist attack on U.S. soil.President Barack Obama was careful not to use the words "terror" or "terrorism" as he spoke at the White House on Monday, but an administration official said the bombings were being treated as an act of terrorism. "We will go to the ends of the Earth to identify the subject or subjects who are responsible for this despicable crime, and we will do everything we can to bring them to justice," said Richard DesLauriers, FBI agent in charge in Boston. He said investigators had received "voluminous tips," were interviewing witnesses and were analyzing the crime scene.Gov. Deval Patrick said contrary to earlier reports, no unexploded bombs were found. He said the only explosives were the ones that went off.Across the U.S., from Washington to Los Angeles, police tightened security, monitoring landmarks, government buildings, transit hubs and sporting events.The FBI took charge of the investigation, converging on a home in the suburb of Revere on Monday night. Authorities gave no details on the search. Investigators were seen leaving a building there early Tuesday carrying brown paper bags, plastic trash bags and a duffel bag.They also repeatedly appealed for any video, audio and photos taken by marathon spectators, even images that people think might not think are significant. "There has to be hundreds, if not thousands, of photos and videos" that might help investigators, state police Col. Timothy Alben said.Boston Police Commissioner Edward Davis said investigators gathered a large number of surveillance tapes from businesses and intend to go through them frame by frame.Investigators refused to give any specifics on the bombs and say, for example, where they might have been hidden or whether they were packed with shrapnel for maximum carnage, as is often the case in terror bombings overseas.But Dr. Stephen Epstein of the emergency medicine department at Beth Israel Deaconess Medical Center said he saw an X-ray of one victim's leg that had "what appears to be small, uniform, round objects throughout it - similar in the appearance to BBs." He said it remained to be determined what exactly the objects were.A European security official said Tuesday initial evidence indicates that the attacks were not the work of suicide bombers. "So far, investigators believe it was not the work of suicide bombers, but it is still too early to rule it out completely," said the official, who spoke from the United States on condition of anonymity because he was not authorized to speak about the U.S. investigation.The Pakistani Taliban, which has threatened attacks in the United States because of its support for the Pakistani government, on Tuesday denied any role in the bombings.The fiery explosions took place about 10 seconds and about 100 yards apart, knocking spectators and at least one runner off their feet, shattering windows and sending columns of smoke rising over the street. Victims lost limbs and suffered broken bones, shrapnel wounds and ruptured eardrums.Roupen Bastajian, a state trooper from Smithfield, R.I., had just finished the race when he heard the explosions. "I started running toward the blast. And there were people all over the floor," he said. "We started grabbing tourniquets and started tying legs. A lot of people amputated. ... At least 25 to 30 people have at least one leg missing, or an ankle missing, or two legs missing. "At Massachusetts General Hospital, Alasdair Conn, chief of emergency services, said: "This is something I've never seen in my 25 years here ... this amount of carnage in the civilian population. This is what we expect from war. "Massachusetts Gov. Deval Patrick says no unexploded bombs were found and that the only explosives were the ones that went off near the end of the 26.2-mile course.Eight-year-old Martin Richard was among the dead, according to a person who talked to a friend of the family and spoke on condition of anonymity. The person said the boy's mother and sister were also injured as they waited for his father to finish the race.A candle burned on the stoop of the family's single-family home in the city's Dorchester section Tuesday, and the word "Peace" was written in chalk on the front walkway.Neighbor Betty Delorey said Martin loved to climb the neighborhood trees, and hop the fence outside his home.Davis said there were 176 casualties at hospitals, at least 17 of whom were critically injured. At least eight children were being treated at hospitals.Tim Davey of Richmond, Va., was with his wife, Lisa, and children near a medical tent that had been set up to care for fatigued runners when the injured began arriving. "They just started bringing people in with no limbs," he said. "Most everybody was conscious," Lisa Davey said. "They were very dazed. "The Boston Marathon is one of the world's oldest and most prestigious races and about 23,000 runners participated. Most of them had crossed the finish line by the time the bombs exploded, but thousands more were still completing the course.The attack may have been timed for maximum bloodshed: The four-hour mark is typically a crowded time near the finish line because of the slow-but-steady recreational runners completing the race and because of all the friends and relatives clustered around to cheer them on.Davis said authorities had received "no specific intelligence that anything was going to happen" at the race. "We still don't know who did this or why," Obama said at the White House, adding, "Make no mistake: We will get to the bottom of this. "With scant official information to guide them, members of Congress said there was little or no doubt it was an act of terrorism. "We just don't know whether it's foreign or domestic," said Rep. Michael McCaul, R-Texas, chairman of the House Committee on Homeland Security.A few miles away from the finish line and around the same time, a fire broke out at the John F. Kennedy Library. The police commissioner said that it may have been caused by an incendiary device but that it was not clear whether it was related to the bombings.The race winds up near Copley Square, not far from the landmark Prudential Center and the Boston Public Library. It is held on Patriots Day, which commemorates the first battles of the American Revolution, at Concord and Lexington in 1775.The first explosion occurred on the north side of Boylston Street, just before the finish line, and some people initially thought it was a celebratory cannon blast. When the second bomb went off, spectators' cheers turned to screams.Runners in the medical tent for treatment of dehydration or other race-related ills were pushed out to make room for victims of the bombing.A woman who was a few feet from the second bomb, Brighid Wall, 35, of Duxbury, said that when it exploded, runners and spectators froze, unsure of what to do. Her husband threw their children to the ground, lay on top of them and another man lay on top of them and said, "Don't get up, don't get up. "After a minute or so without another explosion, Wall said, she and her family headed to a Starbucks and out the back door through an alley. Around them, the windows of the bars and restaurants were blown out.She said she saw six to eight people bleeding profusely, including one man who was kneeling, dazed, with blood trickling down his head. Another person was on the ground covered in blood and not moving. "My ears are zinging. Their ears are zinging," Wall said. "It was so forceful. It knocked us to the ground. "___Associated Press writers Jay Lindsay, Steve LeBlanc, Bridget Murphy, Rodrique Ngowi and Meghan Barr in Boston; Julie Pace, Lara Jakes and Eileen Sullivan in Washington; Paisley Dodds in London and Marilynn Marchione in Milwaukee contributed to this report.